Project templates allow organizations to create standard project models containing default information applicable to the organization. In particular, a calendar with the local public holidays should be created along with Views with redefined headers and footers to suit your organization. Therefore to save time when you create a new project, you should generate your own templates to suit the different types of projects your organization undertakes. At this point in time when you select File, New there will be an additional option for Featured and Personal Templates. Personal Templates are templates you create and save into your template directory. 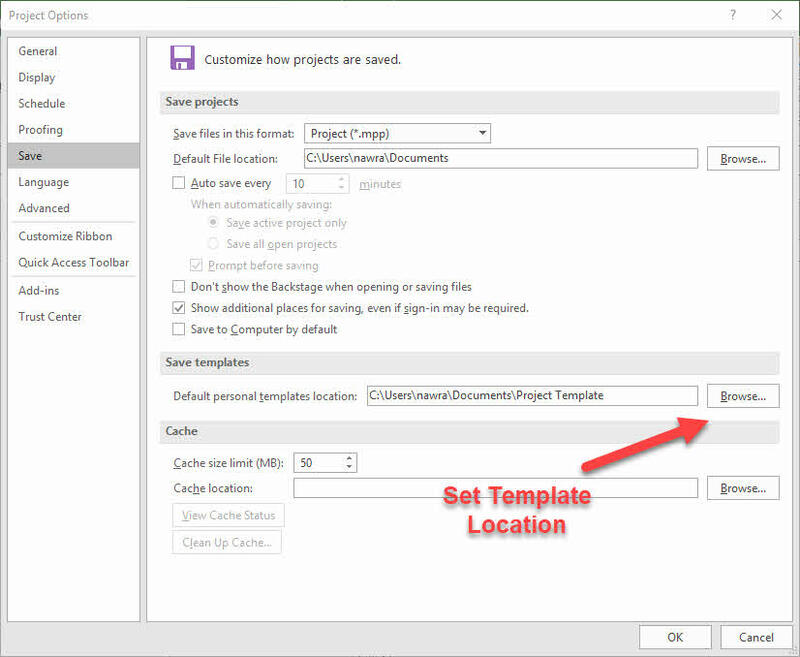 Saving a project, with or without tasks, in Template (*.mpt) format in your Microsoft Project Template directory. You will be given some options when saving the template. This template will be available when you select File, New, My templates. This directory where user templates are saved may be changed by selecting the File, Options, Save tab. Featured are similar to the Microsoft Project Office.com Templates, this will allow you to access Microsoft’s templates. Personal allows you to open templates on your computer. At this point in earlier versions of Microsoft Project you would normally set the Project Start date in the Project Information form by selecting Project, Properties group, Project Information to open this form. But in Microsoft Project 2013 and 2016 this date has now been set.